Tomorrow is Wednesday and that means New Comic Book Day. 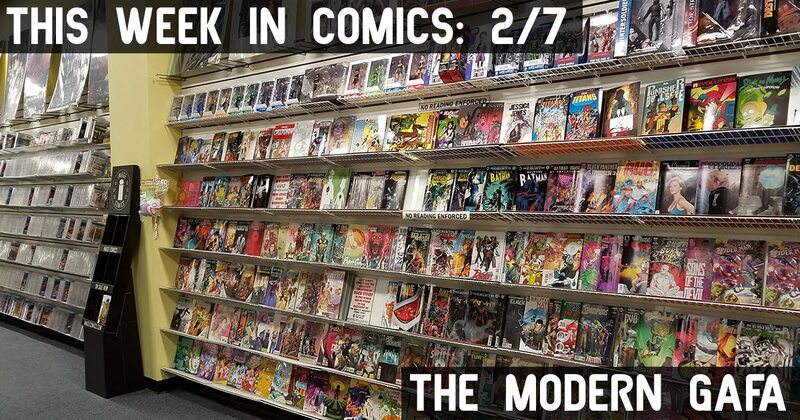 Click the jump to check out some of the new comics hitting the shelves at your local comic book shop this week. Disclaimer: I received advance copies of all comics featured this week courtesy of Image Comics. In this new series by Ivan Brandon and Esad Ribić, war has become a spectator sport where privately funded armies of superstar soldiers march into battle for fame, profit, and the glory of their sponsor nations. The story follows Satta Flynn, a veteran space gladiator who comes face to face with a new breed of soldier and realizes how punishing his time in the limelight can be. VS takes its goofy premise seriously, showing the real horrors of war amid video game-esque rules and regulations. Readers can feel the amount of physical strain on Flynn’s body as he tears himself apart in the name of the game. One of my favorite comics of 2017 returns! This new arc begins with hell itself as the new home for Gertrude, the 10-year-old girl who was spirited away to Fairyland and has spent the better part of three decades trying to get back to the real world. At the end of #15, which began a too long hiatus, Gertrude was killed and found herself in hell. In #16 we find her face to face with the Devil. Since Gertrude has been hardened by 30 years of Fairyland, the Devil has a few tricks up his sleeve to psychologically torture her instead of using the traditional, physical stuff. The Devil creates a new, special hell just for her. I’m so glad this series is back. It’s a deviously hilarious adventure through a rainbow-colored hell. And I love it. This dungeon-crawling fantasy follows a mysterious girl name Luvander and her chance encounter with a prince and his traveling party on a quest into a deep, legendary treasure horde. Trouble follows Lu everywhere she goes, but nothing seems to stop her. The art is beautiful and there are tons of cool little fantasy ideas hidden in every panel. My favorite is these glowing bird-things that are kept in cages and used as lanterns. It’s a fun story set in a world where something different and exciting happens on every page. In addition to Volume 1, #6 is out in comic shops this week. Click here to pre-order Volume 1 on Amazon.